Uncategories Kits Cats Sacks and Wives: How Many Were Going to . . . . Kits Cats Sacks and Wives: How Many Were Going to . . . . I just actually like saying "kits, cats, sacks and wives". Sometimes I just say it over and over for fun. "Kits, Cats Sacks and Wives, how many women are going to the Panguitch Quilt Walk? I guess I could substitute "kits, strips, bags and quilters" for this post if I wanted to be more accurate. I'm headed south of me (a few hour trip) to teach a bag class to a room full of wonderful quilters in Panguitch, Utah. We're going to be making my "Mixed Bag to Quilt" pattern. 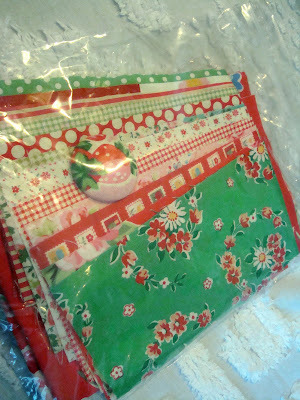 I've been making new bag samples and cutting kits. Here is a bag in the nearly done stage to show as an example. 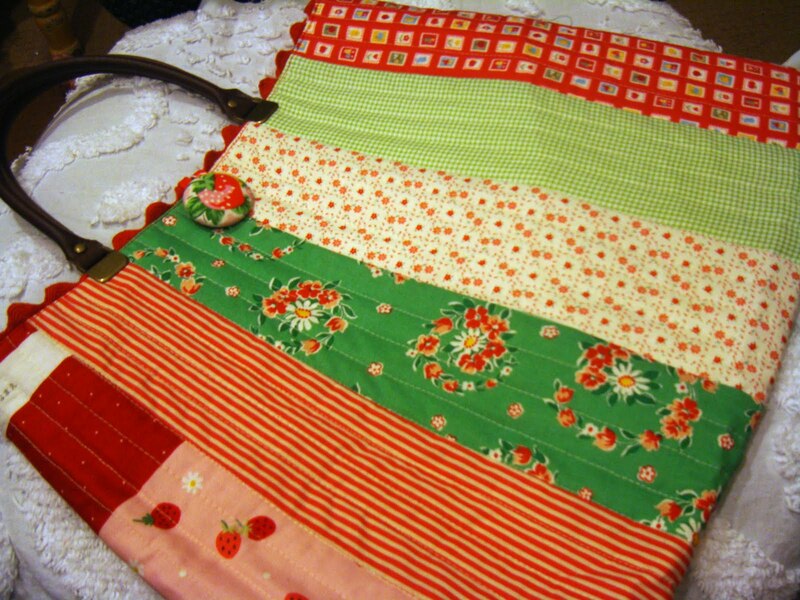 It is a fun and easy bag to make. At least I hope that is what the girls in my class think. These orange handles were cut off an long unused purchased bag and re-purposed. This is a finished sample bag. I used some of my favorite prints. 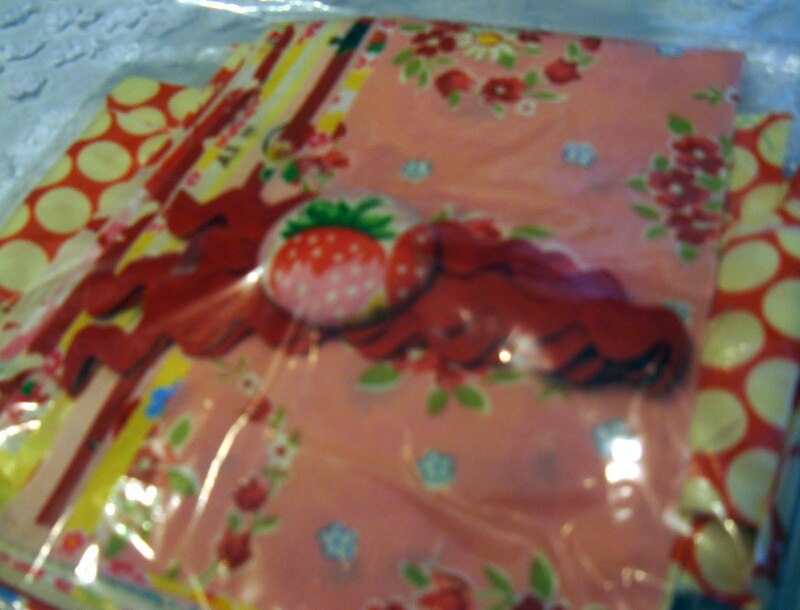 Here is the front with the strawberry button. And this is the back. I love that all 12 strips are different. I substituted plether handles for the cloth handles the pattern calls for. They crimp on when the bag is completed. So so easy. The bag lining fabric in this sample is from Flower Sugar II. I always put my personal label in my bags, too with a front and back pocket. One trick I'll pass along about making lining - cut the lining 1/4" smaller than the bag outside, then the lining fits really snugly without a lot of bunching at the bottom or sides. I've been cutting kits. About half the students in my class opted to make their own kits but some of them wanted kits from Freda's Hive. I hope they like the ones I've made. Wo00w bad photo. 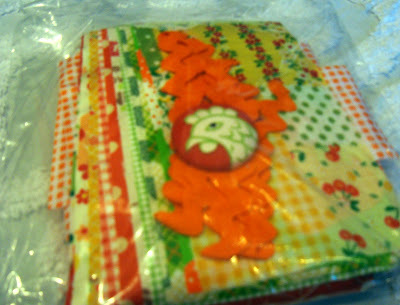 I forgot to photograph before I packaged and I didn't feel like un-packaging everything, sorry. I like to think each bag has a personality. I have about 11 kits made up so the girls can choose. 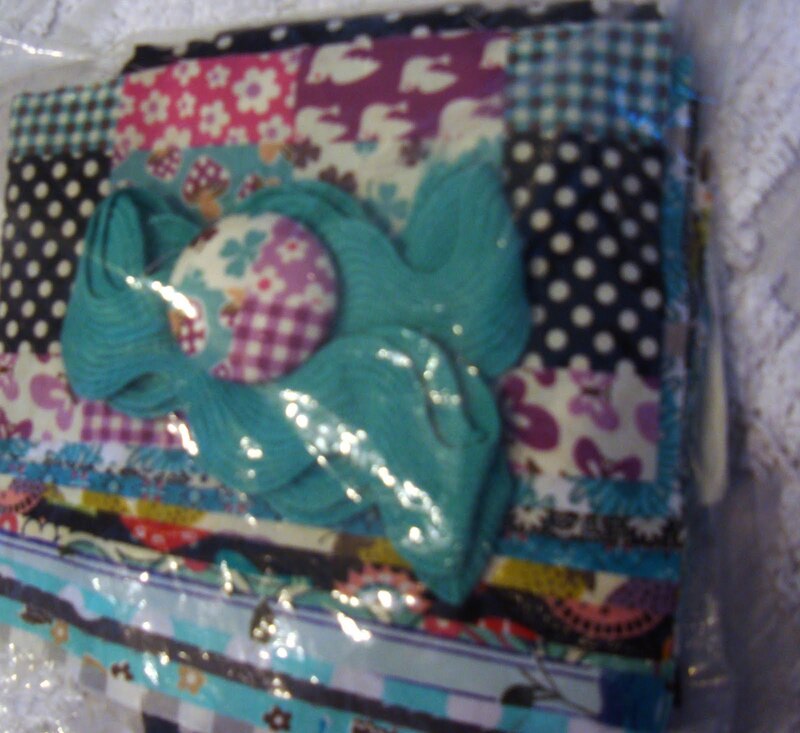 Each kit has lining, rick rack, button, 12 strips cut to size and I also have interfacing and batting to take along. I'm always a little nervous before teaching a class. I like everything to go smoothly, of course. The Panguitch Quilt Walk is a fun yearly retreat. I've been there before. Everyone is so nice. I'll get to see some of my girl pals there too. Nedra, Emily, Leslie and Norma, Joyce, Bonnie Miles, Brenda & Bonnie, Konda, and maybe Sherri will drop by. Should be really fun. Maybe I'll see some of you there too? Come and say hi to me. So cute!!! Have a great time! A fun class, indeed, Nanette. Love the kits - sweet! How fun! All of the kits look like they have a great selection of fabric. If I lived closer, I'd definitely be in one of your classes! Your bags and kits are darling! Have a fun time! I might have to put that show on my calendar next year. It sounds like a fun one. Sounds so fun...my sister lives in Mesquite so one of these years I might have to work in a visit to her and a quilty trip! How fun! I'm especially drawn to the orange sample today :-) I'm sure everyone will LOVE what you've put together. Enjoy! Sounds fun - one year maybe I'll come! I am sure your class will be fabulous as usual. Love the orange for the bag. Love the kits you made!!! Too bad I can't join the classes. Wish I were joining in! 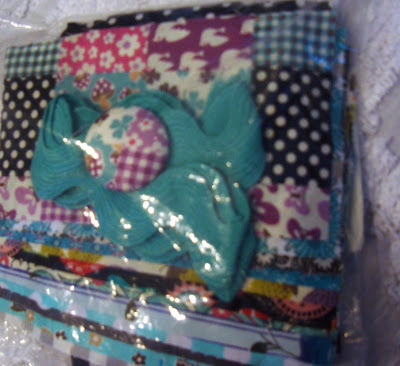 Alas, Southern California is a leetle too far away for a weekend trip :) The kits look great! I love the one with the orange rickrack. How fun! Panguitch is a great town--I lived at Panguitch Lake one of the summers that I worked for the forest service back in the day. I'm far away now... you'll have a great time! The kits look great! I love all those handles, those crimp on styles are cool! These little kits are going to be tons of fun and you're right!... they each have a personality and are so very cute... very Nanette!! All your kits and sample bags are SO pretty! I'd have a hard time choosing just one. Plenty of "Nanette" fabric there, that is what makes them so special. Thanks for the tip about the lining. I'll have to try that on my next one. Have a good time! This does sound like fun. 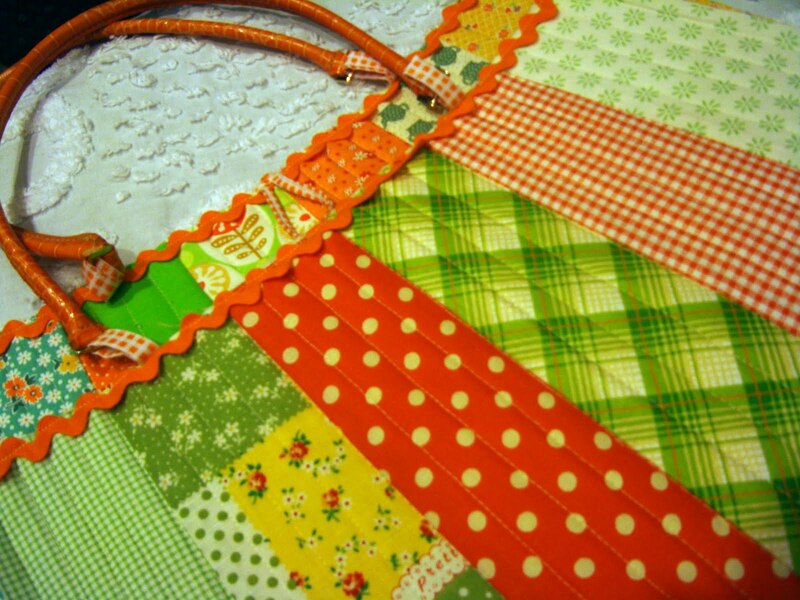 The bags are fantastic but I really love those fussy cut covered buttons--too cute! You just have yourself a swell time at the retreat. It looks like a really fun class and you have been busy with kits. WOW! Oh, I wish I wish I wish I could be there!! I love your kits!! Have a great time!! The kits look great...and I love the fun handles! Wish I were going to be there! I can't wait. I am in your class. Very cute bag Nanette.. Those kits are adorable too, love the chicken button. So cute!! I'm sure those ladies are gonna make you feel so comfortable and you're gonna have so much fun in class. Enjoy and take lots of photo's to share. 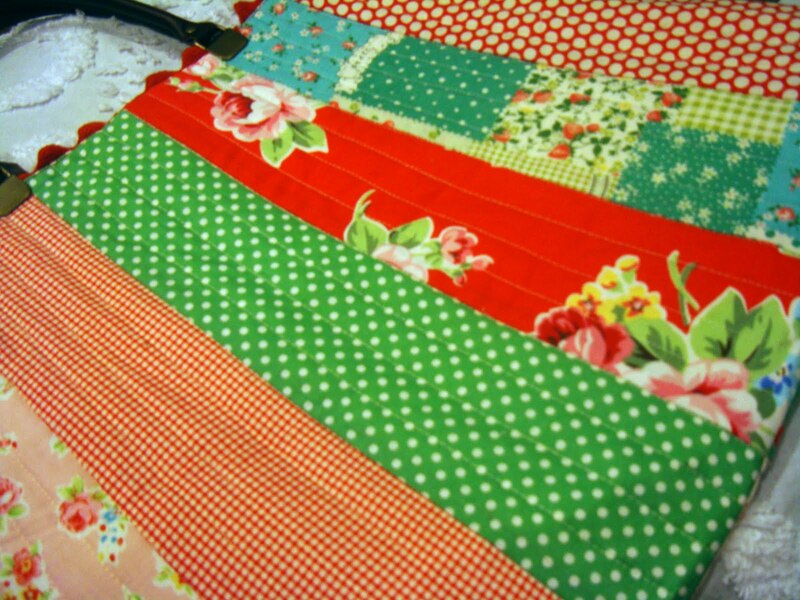 The kits are darling Nanette, I'm sure the ladies will be very happy with your fabric choices. Have a great trip! I'm jealous, wish I was in that class. That is a neat bag & those kits look wonderful. Have a great time! Your kits are awesome!! You have a great eye for fabrics. Have a good time! I am soooo far away Nanette, or I would be there too..
What fun it would be to take a class with you...have fun! Ooooooh, those bag kits are scrumptious! I may have to get my kit out of the Museum of Saved Precious Things and make a bag. Love the lining tip -- that bunching is a perennial problem for me. I like that as much as make your pillow cover one inch smaller than your pillow form so it stays nice and plump. The class will be a blast! 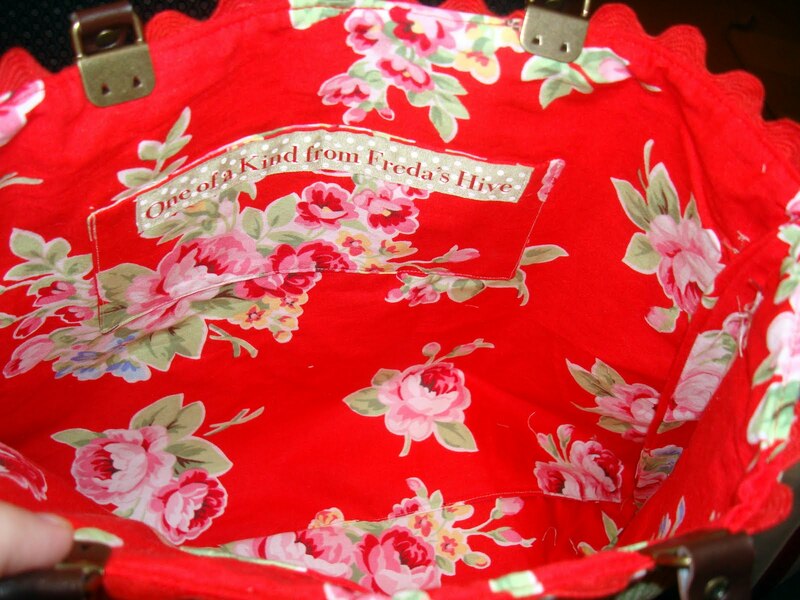 What a great purse..and love, love, love your kits!! A friend of mine has taught at that retreat. In fact I think she might be there this year also. I would love to be in your class. What a super bag -- and those kits look fabulous!! OOOOO...what a FUN class!!! Great kits you made for it, too. Cute bag Nanette! The ladies will be very happy with your kits, I'm sure. Neat bags, have fun teaching your class. Thanks for the hint on making the lining a little smaller. Have fun at class! The bags are adorable! AWESOME fabric combinations. I'd be hard pressed to choose! I love the orange kit with the rooster button...love, love, love it. Are you going to sell the kits? Such a cute, cute bag with GRRREAT fabrics. How wunnerful. I hope you have the best time in Panguitch. It's certain to be a time brimming and teeming with delight and joy! Oh you are so blessed in many ways! Wish I was a quilter! I sure love fabric! Sweet patterns in your Etsy shop! 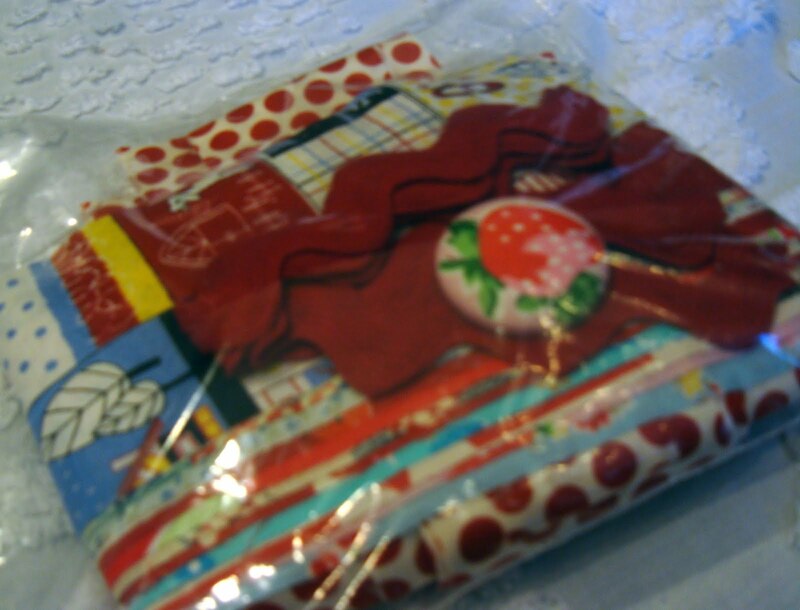 Your fabric choices are superb and I'm sure the girls who brought their own kits will be tempted to get one of yours. It will be a great class. Hope you have a lot of fun at the retreat! I hope you had fun at your class! That's an adorable bag design and I just love the fabric combos that you put together in the kits. I'm sure they all turned out great. I hope we get to see some pics of the finished bags.